L-R: Ruby Webster, Sarah Graham, Lee Kemp, Jack Roper, Kieran Gill. An East Midlands company which recruits staff for key regional employers like Mars, Travis Perkins and Ashfield Healthcare is planning to expand its presence after boosting its own team. 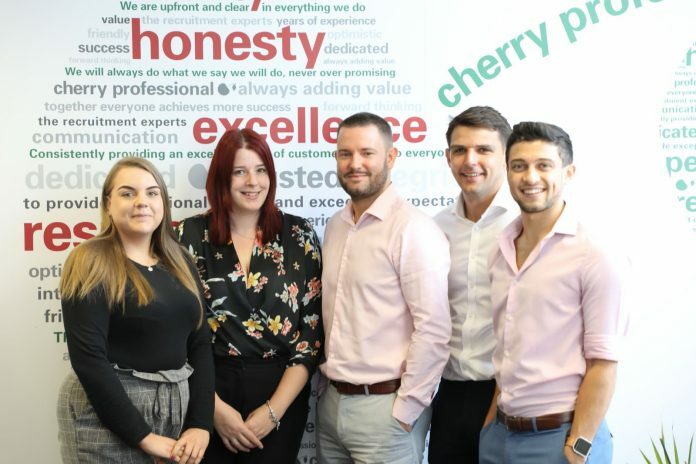 Cherry Professional has strengthened with five new hires – including three to cover its Leicester recruitment team – taking staff numbers to 27. Cherry specialises in accounting and finance, finance clerical, administration and business professionals, and human resources. Kieran Gill, Lee Kemp, Jack Roper, Ruby Webster and Sarah Graham have been hired as Cherry Professional rebrands with a new website and logo. Managing Director Danielle Asano said: “We have always had a presence in Leicester, but with the increased need for a quality recruitment service we wanted to be able to provide a full, focused solution to all clients and candidates. “That is the reason we had a recruitment drive ourselves so that we can build on our reputation and help more businesses and candidates achieve their goals and ambitions. Lee, a former trainee solicitor who has four years’ experience in recruitment covering procurement and supply chain, will now specialise in the permanent qualified finance market in Leicestershire. He said: “I gained a wealth of experience with a large recruitment firm and am now looking to utilise this with Cherry and take the company to the next level. Due to my background, I have had exposure to dealing with clients of all sizes and providing them with the best service possible. Jack Roper, armed with five years’ experience in the industry, has relocated from Manchester and will recruit temporary qualified finance staff in Leicestershire. Jack has noticed a “buzz” across the city since Leicester City’s unexpected Premier League title triumph in 2016, making it an exciting place to work. “It’s brought a new sense of unity after the whole city got together to celebrate,” he added. Kieran, who is new into recruitment after a background working in hospitality, will specialise in hiring part-qualified finance professionals in Leicester. He said: “I’m most excited about recruitment because I love working with people and think it will be great to help people realise their dreams and goals. I’ve always been told by others I should go into recruitment, but I was never swayed until I met with Cherry as the company’s values drew me to it. In the Nottingham Head Office, located at Chiltern House, Castle Gate, Sarah Graham has joined as marketing assistant to support marketing manager Melissa Kilday. She will help with ambitious plans for the company over the next five years following the rebranding exercise. Ruby has been hired to cover the finance clerical market in Derbyshire and is based in the company’s office on Vernon Street, Derby. She has two years’ experience in permanent recruitment for commercial clients. “My biggest change was going from permanent recruitment with no focus to having a focused market and location to cover, and recruiting for temporary positions,” she said.